Following a tease back in November, Ancient Games has offically announced Susume!! Mamotte Knight: Hime no Totsugeki Serenade for Switch. It will launch in 2019 in Japan. Susume!! 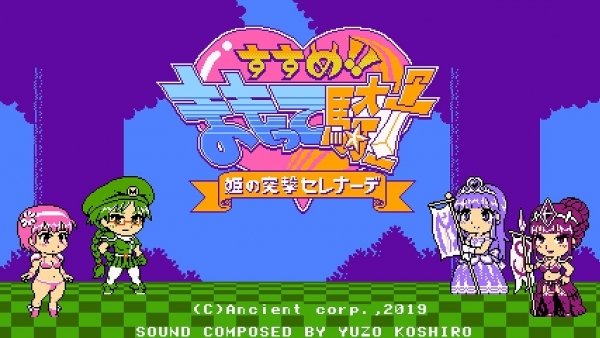 Mamotte Knight: Hime no Totsugeki Serenade is an offline and online multiplayer-supported game where players control the “Mamotte Knight” to protect the princess from incoming enemies. A new element has also been added where the castle moves along a track, and when the castle arrives at track checkpoints, a large wave of enemies and bosses attack. When you arrive at the enemy’s castle waiting at the end of the track, you must ram the enemy’s castle with your own castle to destroy it and clear the game. Players choose three characters from eight types of Mamotte Knights, such as Archer, Fighter, and Amazon, and fight on an always-changing battlefield. While you can be revived if you take damage and die, the game will be over if the princess is attacked and her HP lowers to zero. Players can set barricades to protect the princess, or have the castle take damage while the princess stays in the castle. However, if the castle takes too much damage, it will be in the down state for a fixed period of time, leaving you and the princess defenseless. To clear the game, you must repel enemies while skillfully restoring barricades and the castle.